IUGO Mobile Entertainment is proud to announce that Animal Academy: Fairy Tails is now available on the App Store for iPhone, iPod Touch and iPad. Animal Academy: Fairy Tails, the third installment in the beloved Animal Academy series, is a social town building game set in a vivid and colorful fairy tale world. Players can build the fantasy town of their dreams, interact with all-time favorite storybook characters such as Robin Hood, Snow White, and Rapunzel and share their very own fairy tale world with their friends. In true Animal Academy fashion, players expand and build their fantasy town while getting a chance to show their expertise answering trivia and personal questions from their favorite animals. 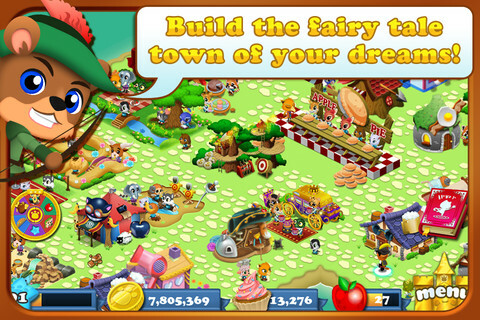 Fairy Tails goes into even deeper gameplay, allowing players to interact closely with the main characters by completing their storybook quests, collecting their rare gifts and unique homes. Players get social by sharing their town with real-life friends and even helping each other out by leaving special fairies around to help friends earn coins, cupcakes and more. Weekly bonuses, daily mystery prizes and frequent content updates keep the world of Fairy Tails exciting, ever-changing and enchanting! Animal Academy: Fairy Tails can be downloaded for free from the App Store and is compatible with iPhone, iPod touch, and iPad devices running iOS 4.3 or later. This entry was posted on Friday, November 9th, 2012 at 7:43 am and is filed under Casual, Everyone, Mobile, National News, New Releases, Simulations. You can follow any responses to this entry through the RSS 2.0 feed. You can leave a response, or trackback from your own site.